Gross domestic product, the broadest measure of economic activity, grew by 3.2% at an annualized rate in the last quarter of 2010, an improvement over the 2.6% growth rate registered in the third quarter. The 3.2% growth in the fourth quarter finally pushed GDP to a level not seen since before the Great Recession. The three-year lag between the previous business-cycle peak and a return to prerecession output levels is the longest since World War II. On average, the U.S. economy has been 9.4% larger three years after a recession’s beginning. 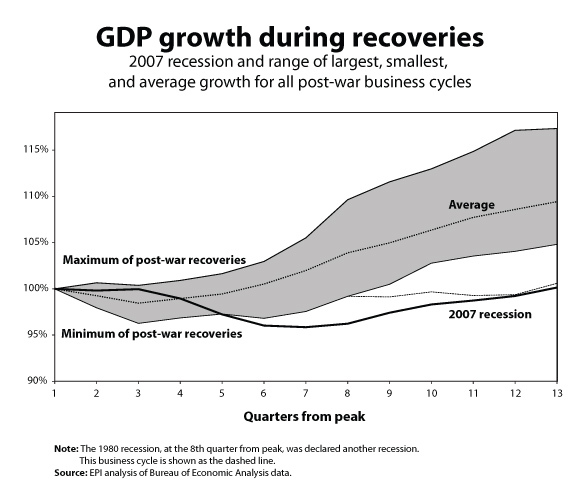 The long lag time highlights not only the depth of the economic plunge in the Great Recession, but also the very slow recovery from the recession. The recovery and the improvement in growth from the third to the fourth quarters are welcome, particularly because they occurred in a quarter that experienced essentially no support to growth stemming from the American Recovery and Reinvestment Act, which has largely run its course. Beneath this 3.2% headline number, however, today’s report from the Commerce Department contained a number of mixed messages about the underlying health of the economy. Some good news is that final demand (a measure that strips out the volatile contribution of changing private inventories) grew by its fastest rate since 1984, growing at a 7.1% annualized rate. However, the final GDP growth rate was substantially lower than this because a very large deceleration of inventory accumulation subtracted 3.7% from GDP growth in the quarter. The fact that inventories were a drag on growth in the quarter was no surprise (though the size of their contraction was)—inventory accumulation had boosted overall growth substantially for five straight quarters and this trend was bound to reverse. Another development that was expected but surprising in magnitude in the fourth quarter was the very large boost to growth coming from net exports, which contributed 3.4% to the final growth figure. Net exports had subtracted substantially from growth in the past three quarters, and the pace of the rise in the trade deficit this trend represented was unlikely to be sustained. Unfortunately, it seems very unlikely that net exports will be a reliable contributor to growth over the next year, especially given the economic weakness of many of the most important export markets for U.S. goods. Consumer spending contributed 3% to growth in the quarter, a sharp increase from the quarter before and its largest contribution since the first quarter of 2006. This spending led to a fall in the personal savings rate to 5.4%, down from the 6.1% average of the previous six months. However, because home prices have been falling steadily for the past five months, it seems likely that this uptick in consumer spending will not repeat; falling home prices reduce household wealth and lower wealth generally constrains spending. Investment in equipment and software, which averaged 18.8% growth the year before the fourth quarter of 2010, slowed down considerably to 5.8% annualized growth. Residential investment grew slightly in the quarter, after a 27.3% drop in the previous quarter. Again, given that home prices have been declining for months, it seems unlikely that residential investment will be a reliable contributor to growth in coming quarters. Government spending—both federal and state and local—contracted at 0.6% and 0.9% annualized rates, respectively, providing a mild drag on growth. Core inflation remains very low—the market-based measure for personal consumption expenditures excluding food and energy rose by less than 1% between the fourth quarters of 2009 and 2010. Today’s report raises more questions than it answers, but what should be kept firmly in mind is that the 3.2% growth rate is insufficient to provide more than minimal downward pressure on the economy’s unemployment rate. If the economy grew by 3.2% in 2011, unemployment would fall from the 9.4% reported in December 2010 to roughly 9.3% in December 2011. In short, today’s report indicates that the U.S. economy is now producing more than it did before the Great Recession hit, but is by no means completely healthy.